We know what happens when entire nations cannot stymie their collective fears. We know what happens when whole civilizations select a scapegoat for inexplicable suffering. History maps these trends. Throughout the Myths Across the Map series (now available through Gareth Stevens Publishing), I chronicled 4 of the 6 major global myths. I tracked down the beasts, the monsters, and the marvels universally recognizable to all people everywhere. Why does everyone know and recognize a vampire? How did dragons creep into the skies, wells, caves, and rivers of every inhabited continent? Why are the symptoms of werewolves the same whether you are in Russia, South America, or Louisiana? And just how many ancient kingdoms did zombies mob before noshing on our modern metropolises? Our currently fraught geopolitical landscape may have us all hoodwinked when it comes to fear. Fear, the pundits claim, adds to our isolation. It divides us. It shuts down communication. However, history indicates that shared fears actually unite us. They give us a common language and a way to communicate across boundaries and borders. What is more, they give us good reason to work together and defeat a common threat (such as a deadly disease). What better time than now to get young people navigating and debating the nature of mankind’s fears and the power of humanity’s myths? At a time when our national attention sits securely, sometimes obsessively, on the goingson of Washington, D.C. and our national leaders — be they elected, electoral, or judicial — young viewers and readers deserve thoughtful texts exploring the roots of our rights. When the editors invited me to author two books in the Our Basic Freedoms series, they challenged me to write about the First Amendment without the armor of my own political, personal, or professional biases. I was to approach the topic with an open and accepting mind. This was, in no way, an easy assignment. As I writer, I feel duty- and honor-bound to the philosophy of free speech. As if me and Free Speech pricked our fingers, mashed our blood beads together, then swore an oath and spat to make eternal. Same goes for the right to petition, which really boils down to the pen’s might over the sword in disputes. However, the guideline proved invaluable to my research. Unarmored (and consequently unafraid of rust), I dove deep into the murky waters of Constitutional interpretation. I found credible, logical support for all sides. I discovered the tension, the constant tug-of-war for power, that makes our government function. Sure, it often resembles dysfunction, but the Framers and Founding Fathers knew that if they could keep power from ever coagulating in one corner, then all sides would have to bend (stretch their vulnerable, thirsty throats) in order to get even a taste of what they wanted. What’s in store for the nation now that so many of the protocols intended to keep power bouncing and swinging, and swirling have been rescinded or altered or diluted? Well that is a future story being written as we speak; a narrative that young readers are due to inherit. Where can you find these books? Hill, Laban Carrick. 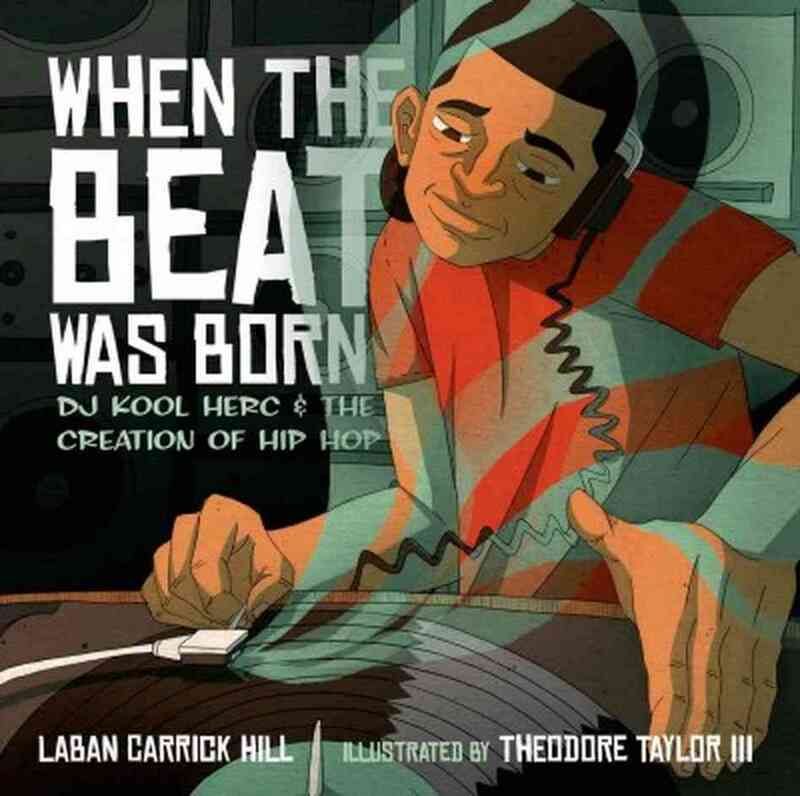 When the Beat was Born: DJ Kool Herc and the Creation of Hip Hop. Illus. Theodore Taylor III. New York: Roaring Book, 2013. Print. Summary: Clive Campbell falls in love with music and dance parties while growing up in Jamaica. He moves to New York where he eventually becomes a very famous DJ with a lot of dynamic ideas for music. His ability to get people dancing suppresses violence between gangs and unifies whole neighborhoods. Critique: The artwork matches the feel of the book. Hard-edged, a bit geometric, and a bit whimsical. Thick colors, very vibrant. Hill uses a steady refrain as the unifying element of the story. Every couple of pages, the story pauses and reminds the reader how Clive loves to hear the music “hip hip hop, hippity hop.” The text clearly defines terms like the “breaks” in a song, mixing beats into those breaks, as well as why b-boys are called b-boys and more. Back matter includes a fun timeline, bibliography of books, films, and web sources, and an author’s note about how he uncovered the story. O’Connell, Caitlin and Donna M. Jackson. The Elephant Scientist. New York: Houghton Miffling Books for Children, 2011. Print. Summary: This is a true story. Caitlin grows up with a love for science. She studies bugs, but then gets a chance to study elephants in Africa. One day, no joke, her supreme knowledge of bugs leads to several breakthrough discoveries on how elephants communicate. Like: elephants may “talk” through their feet! She applies her knowledge to save elephants! Critique: 2012 Sibert Honor Book. The beginning feels a little slow. Readers are introduced to Caitlin and her studies, but are not given an emotional reason to invest in this woman or her story. But then she gets to Africa and everything shifts. Caitlin must find a way to keep elephants out of the farmers’ crops without injuring anyone–elephant or farmer. And that’s the moment where the story really sparks! Caitlin’s dilemma is pressing and difficult to solve. 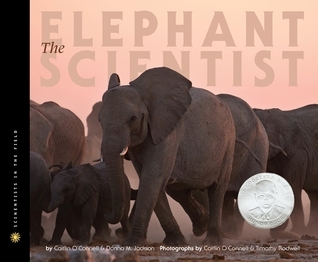 From this point on, the book rollicks alongside cleverly embedded information on elephants, animal communication, and conservation efforts.